Description: This patented formula will remove damaging phosphate build up that is in any swimming pool filter and in the pool water. Function: Phosphates are inorganic chemicals that typically enter swimming pools through regular city water lines, rain, plant waste, fertilizers, lawn run-off and even tanning oils. Phosphates are the building blocks for algae, so increased levels of these chemicals can transform any above ground swimming pool into an above ground pond filled with green organics. 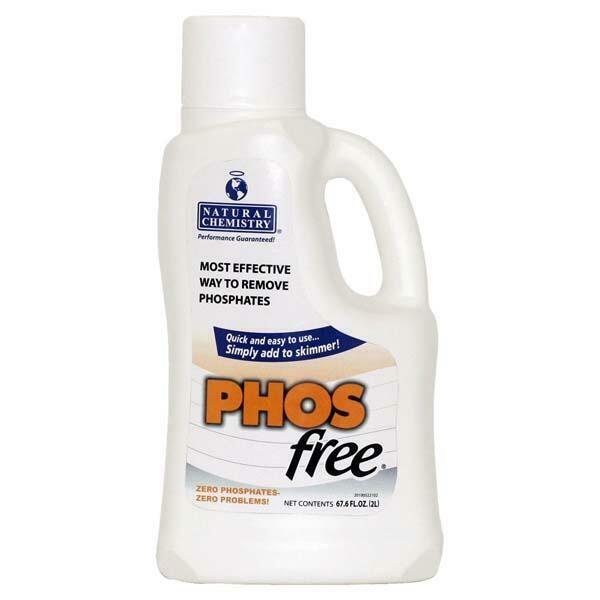 Use PHOS Free by Natural Chemistry to remove unwanted phosphates from your filters! Be sure to test swimming pool phosphate levels before application. The ideal range for application is between 0 and 300 pbb. Application must be on an algae-free pool; if algae are present it must be removed before application. Utilize the dosage chart on the back of the bottle to add the required amount to your pool skimmer. Add slowly to ensure complete filter system dispersion. Run filter for 8 hours per day or 48 hours continuously until phosphate level falls to zero. Swimming is allowed directly after application.